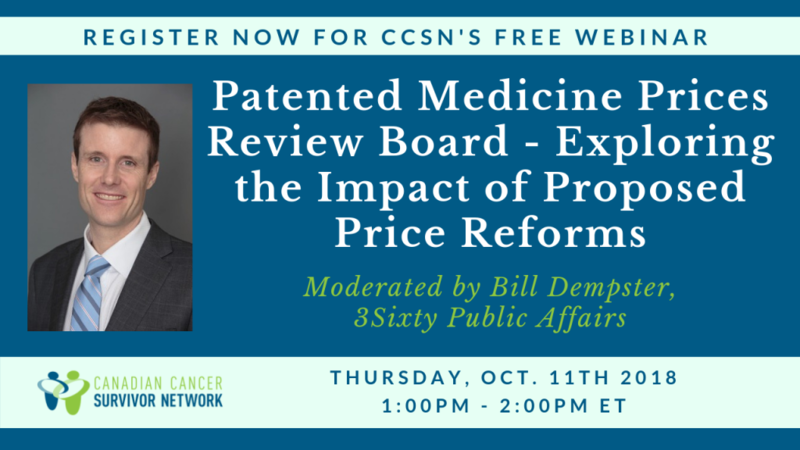 Join us for our next webinar to learn more about the Patented Medicine Prices Review Board and the impact of their proposed price review reforms. This engaging webinar will be moderated by 3Sixty Public Affairs’ Bill Dempster, who will be joined by a panel of experts. Former PMPRB staff member Neil Palmer will analyze the government’s perspectives on the proposed reforms. Carole Watson from Janssen will present a case study outlining the effects of the proposals on a pharmaceutical manufacturer’s decision making regarding the launch of a new cancer medicine and Martine Elias, Executive Director of Myeloma Canada, will provide input on the proposed reforms from a patient leader perspective. A moderated Q&A session allow all participants to provide their perspectives and questions on how the proposed pricing reforms might impact the availability of new innovative treatments in this country. This is the first in a series of eight CCSN webinars on health technology assessment and drug approval. Stay tuned for further webinar announcements.